Consumers, given the choice, will often purchase products and services from socially and environmentally responsible companies. Companies and non-profit charities are taking advantage of this fact, and the last quarter century has seen the rise of cause marketing, promotional campaigns that increase profits while benefiting a cause. Cause marketing is now the primary avenue by which companies demonstrate social responsibility. Cause-related marketing is a specific form of cause marketing in which a company partners with a non-profit organization to raise funds for a particular cause. Cause marketing can be beneficial to both the for-profit company and the charity. For the non-profit, there is the prospect of tapping into the business’s marketing resources and exposure to the company’s customers. For the company, it can mean a public relations boost and increased sales. Even consumers benefit by being able to support a charity simply by making a purchase. How Does Cause Marketing Work? Cause marketing works best when there is a certain synergy between the non-profit organization and the company they are partnering with. Ideally, the non-profit’s mission and vision should have some relation to the company’s products or services. It is best if the business’s employees and customers are excited about the cause as well. The right affiliations make for the strongest promotional campaigns. These partnerships do not always involve a straight donation from the company to the non-profit organization. Instead, businesses will often donate products, services, or their employees’ time. This kind of charitable work tends to have a stronger impact on the consumers being targeted. The marketing campaign’s goals will be to motivate customers to take some sort of action like donating money or volunteering their time. An effective campaign will not only solicit help, it will raise awareness for the non-profit as well as the company’s philanthropic efforts. The advantages to the business include increased sales and public awareness of its social responsibility. A non-profit’s benefits can be significant. Monetary donations and an increase in volunteers are the two primary benefits. In addition, the non-profit is likely to enjoy increased exposure in advertising and publicity from their relationship with a for-profit company. Depending on the company partnered with, the amount of advertising and publicity generated is likely to be greater than what the non-profit can accomplish on its own. The BNI Foundation’s mission and vision place it in a unique position to benefit from cause marketing. Our association with BNI and its members – all of whom are business people – provides excellent cause marketing opportunities, and BNI’s core value of Givers Gain® reflects perfectly the BNI Foundation’s goals. When BNI chapters integrate the BNI Foundation’s impact into the BNI corporate culture, the BNI brand is elevated, brand loyalty surges and member and alumni engagement and retention are impacted positively. The charitable activities of the BNI Foundation, along with our aggressive online marketing presence, already lend added credibility to the BNI brand. Deeper relationships between the BNI Foundation and BNI chapters and members act as a tool toward BNI brand awareness, loyalty and recruitment. As Dr. Ivan Misner clarifies in this video, the BNI Foundation is your foundation. The time, treasure and talent you give benefit the children and schools in your community. Currently we are working on increasing our membership among BNI chapters and members. Back to school time is the ideal time to get your BNI chapter involved with the BNI Foundation and cause marketing. Click here to get started on this win/win opportunity. Boys’ Haven is a general residential operation in Beaumont, Texas that serves boys ages 5 to 17 and provides a port for stormy times in the boys’ lives. Many of these boys come from single parent homes and are in need of a more structured environment. Some are referred by Juvenile Probation Departments and the Department of Family and Protective Services. The program is based on the principles of discipline and hard work, a program where natural consequences occur and privileges are earned. Boys Haven has been in operation for more than 70 years. The organization will use the $1000 Givers Gain® Grant to enroll its residents in the Equine Therapy Summer Program provided by Stable Spirit. The therapy is designed for those who have suffered some form of abuse or neglect in their lives. The boys learn about themselves and others by participating in activities with horses and discussing thoughts, beliefs, behaviors and patterns. The BNI Foundation is proud to support Boy’s Haven and the fine work they do. Too many non-profit organizations fall into a financial trap of their own making. Being mission driven, they find themselves focusing on providing services without a clear picture of where the money will come from. Many non-profits fail to put a solid fundraising system in place. A major study of the challenges facing non-profits conducted in 2013 found that almost a quarter of the organizations surveyed had no fundraising plan whatsoever. Additionally, many non-profit board members lack training on essential fundraising skills like donor identification, prospecting and cultivating. Non-profit organizations need a solid fundraising culture to succeed. Too many non-profits find themselves dealing with one financial crisis after another when efforts are too heavily focused on the cause, and few resources are dedicated to funding. Some in leadership positions at non-profit organizations do not consider income generation their top priority. This kind of thinking can cause an organization to fail to thrive, or worse, flat out fail, despite great ideas or potential. A strong fundraising culture is created when all of an organization’s members and donors have an awareness of its mission and funding needs and are enthusiastic to work toward making both succeed. With a bit of basic information, and an appreciation for how the mission and fundraising interact, members and volunteers will create a network that spreads the non-profit’s vision and is ready to capitalize on fundraising opportunities. These basic tenets encourage a positive fundraising culture. Members should understand exactly what change the non profit organization is trying to affect and how it goes about doing that. What are the primary goals of the non profit, and how does it use its resources to serve the community? Being able to articulate these points allows members and volunteers to promote the non-profit’s work. Every non-profit organization must understand the costs associated with sustaining its mission and vision, as well as its programs and services and how to make the project sustainable. The basics of the financial plan includes information about revenue sources and administrative and organizational expenses. Donors and members must know who donates to their non-profit and where other funds come from. Having fundraising pitches or elevator speeches prepared for every occasion is essential to take advantage of whatever opportunity arises. Preferably, board members already have pitches they use to secure donations from the philanthropists they solicit, but everyone ought to have an idea of what to say if the subject arises. It could simply be clearly communicating the organization’s goals, strategies and needs. Ideally, non-profits must secure support from many different sources. Some financial sources will occur episodically from events, a grant award or single donation. A combination of episodic and ongoing support, such as endowments, annual funds, recurring grants and the sale of services or products are preferable. Here are some traditional sources of philanthropic funding that non-profits can rely on. Charitable Contributions from individuals account for almost three quarters of all charitable giving in this country. Corporate Contributions have taken on added importance to companies as socially conscious consumers increasingly turn to like minded companies when making purchasing decisions. Government Grants fund programs on the local, state and national levels. Foundations come in many forms including family, community and corporate. Their purpose is to generate funds for other philanthropic organizations. Non profit-organizations need to consider all of this and more to be successful. If every member at every level of the organization is committed to both the mission and the fundraising, the non-profit will have a substantial advantage in receiving support of all kinds. The BNI Foundation is YOUR foundation. Our mission to create a conduit between business and education to meet children’s educational needs is powered by BNI. We rely on the support of BNI members, but anyone can help with their time or money. Click this link to find out how can take action. To highlight the incredible impact adults can have on the lives of children, we asked our supporters to submit video “testimonials” describing an adult who significantly influenced their life. We received many inspiring one minute videos sharing stories of mentors, coaches, teachers and other leaders who inspired and even changed the trajectory of lives between kindergarten and high school graduation. The first place winning video is above. Josh Perry of FusionForge Consultants describes a volunteer named Ray who brought knowledge, passion and excitement to a Junior Achievement economics course he taught at Josh’s high school. “As a result of the time spent with Ray, I went on to donate time back to my local high school,” says Josh, “For four years as a volunteer with a local youth ministry active in the school and for another two years as a substitute teacher.” Josh’s prize for winning the contest is a day with BNI Foundation co-founders, Ivan and Beth Misner, in Austin, TX. Second place went to Lonnie Young of Young & Company. In the video (view HERE) Lonnie remembers the man who turned him on to math, which led to him becoming an accountant. Lonnie’s Prize was a $75 Amazon gift card. Our third place winner (view HERE) was Robyn Smith. Robin recounts how her mailman inspired her entrepreneurial spirit and drive. Robin recieved a $50 Amazon gift card as a prize for sharing her story. Congratulations to our winners, and thank you to all of the entrants for participating. Their videos illustrate how even small gestures and actions by adults can make a big difference in children’s lives. This summer’s Business Voices® Back to School Supply Drive is in full swing. Now is the time to review our toolkit for supply drive project ideas and how-to’s. The toolkit is a great source of information you will need to plan and execute a successful drive to bring much needed support to local schools. There are a number of different approaches you can use and details for each one are in the Business Voices® toolkit. The Back to School Supply Drive is an easy way to impact students’ learning experiences. You can make school a better place for students and teachers just by providing school supplies. Our June blog post illustrated how most teachers must pay out of their own pockets for necessary supplies that are not provided by the schools. This is an important time of year for teachers to collect the supplies they will need throughout the school year. Help the children in your community to feel empowered by having the items they need to focus and learn. The toolkit should have all of the information you need, but if you have any questions about projects or starting a Business Voices® team, contact us at info@bnifoundation.org. The BNI Foundation awards the Givers Gain® Grants to schools and educational organizations twice a year in May and December. Ten awards of $1000 each are typically awarded. The grants are used to enhance classroom learning with the goal of benefiting as many classrooms, teachers and students as possible. Here are the winners for May. The grant funds will be used to provide Equine-Assisted Psychotherapy and Equine-Assisted Learning sessions for residents of Boys’ Haven who have all experienced some form of abuse or neglect in their lives. The boys learn about themselves and others by participating in activities with horses and discussing thoughts, beliefs, behaviors and patterns. This grant will be used to purchase ARISE evidence-based life skills curriculum for teens. The curriculum helps students with a number of topics including anger management, domestic violence and sexual abuse, self-esteem, time management, career networking, finances, health and hygiene, school drop-out prevention, nutrition and exercise, and safety. The grant money will be used to purchase two cash registers, a bar code label maker and supporting materials. Our program supports students age 18 to 22 with special education as they transition from school life to adult life. The registers will be used at our MOSAIC store and at shows and events where the students sell items and crafts they make themselves. We are establishing a resource room where students and their families can study, get help from teachers, work on assignments and receive help from volunteers and school workers. The grant funds will go toward computers, printers, furniture, reference books and supplies for the resource center. Congratulations to all of the Givers Gain® Grant recipients. We wish you success in your endeavors. Teachers are Picking Up the Bill for Their Own Jobs. Teachers investing their own money into the classroom have become so commonplace around the country that it is now taken for granted. For years, schoolteachers have learned to accept the fact that they will spend part of their salaries on items for the classroom. New teachers entering the profession are generally aware of the situation because it is widespread and because they are told as much in college. This information is even found in some college textbooks. Studies have determined that the average teacher spends as much as $1000 yearly on necessary supplies not provided by their employers. These out of pocket costs could add up to a major expense, especially for someone just starting a career. But, as mentioned, most teachers enter the profession knowing what is expected. New teachers are not likely choosing the career for it’s high income potential. This kind of sacrifice requires a different perspective and a willingness to take on the responsibility to do what is needed to perform the job properly. The list of items purchased for the classroom by teachers is extensive. It starts with the decorations teachers use to liven up the classroom and engage their students. The colorful, educational banners, map, posters, alphabets and other learning tools that are ubiquitous in classrooms create a warm atmosphere conducive to creativity and learning. Without teachers taking on the expense, classrooms would be very different places. As public school budgets continue to be hit, teachers find themselves having to cover even basic supplies like books, paper and pencils. Meanwhile, some have to work with decades old textbooks because they are not prioritized in schools’ budgets. Even furniture is not out of the scope of teacher spending. In impoverished neighborhoods, it is common for teachers to spend on items unrelated to education to help their students. Teachers will pay for classroom snacks, student meals on school trips and personal items for students with the most need. It is not unheard of for teachers to pay for students’ college applications and curriculums. There are other ways that educational budget cuts affect teachers. Less money means less incentive to join and stay in the profession. Here are some other effects of the lack of proper funding. Lower Pay – This translates in to smaller paychecks, or losing a job when a school district decides to reduce class sizes. Reduced Benefits – School district contributions to teacher benefits can be lowered when cuts need to be made somewhere. Fewer Equipment Purchases – When money is low, schools may put off investing in technology like computers. Teachers and students suffer when they do not have up to date equipment. Fewer Electives – A school facing budget cuts will typically cut non-core subjects from the curriculum, sometimes cutting teacher positions in the process. Larger Class Sizes – A common response to budget cuts, bigger classes are less conducive to one-on-one instruction and cooperative learning. As things stand now, some 20% of teachers quit the profession within the first three years. Educational budget issues do not help matters. Whether teachers accept it or not, they should not have to bear this financial burden. The BNI Foundation was started to address these sorts of issues. Our Business Voices initiative works to get business leaders involved in education by volunteering their time and talents, while our Givers Gain Grants help fund educational projects. Learn more, visit bnifoundation.org. Who’s In Your Story? – A USA Video Contest! WHO: When you were growing up, did you have an adult who significantly influenced your life? Then, we at the BNI Foundation want to hear from YOU! WHY: We want you to share your story with us so we can share it with the world so people will see and hear the huge impact that adults can have on kids! WHAT: So, tell us in a 1 minute or less video, about the person who inspired you, possibly even changed the trajectory of your life when you were between Kindergarten and High School Graduation. We especially welcome stories in which a small gesture or action made a big difference, showing how easy it can be to help our youth, without always spending a ton of time over many years. It can be raw footage, shot with a phone, and does NOT need to be professionally filmed or edited. to a video that can be downloaded from another place. Have fun making your videos and telling us your stories!!! Become a Sonoma Valley Winemaker! A few years back, Beth Misner, Co-Foundation of the BNI Foundation, initiated a fun event. Beth decided to start walking on Saturday morning of the BNI Convention. In the beginning, she invited a few special people to walk with her and to conduct 1:1 conversations. This idea grew into a larger event, with many BNI leaders, members, and GST staff participating. It has not just become a BNI Foundation tradition, but a fun event at BNI Conventions, both locally and globally. Some walk, some run. This is your perfect opportunity for a casual dance card or 1:1 with Graham Weihmiller, Beth Misner or Stephanie Starr. 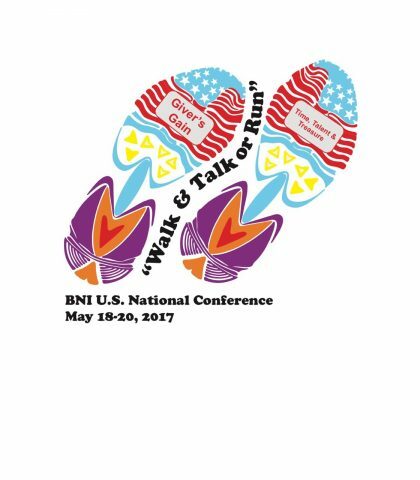 The Walk and Talk (or Run) will take place on Saturday, May 20th at 6:15AM. Please register online here. We are happy to take registrations on-site, but this year, we are adding a fun t-shirt to our first 50 registered walkers and runners as a THANK YOU! Register Today, as t-shirts are going fast. Show your BNI Foundation support and pride!